Peter Le Beau is one of the best known consultants in life and health insurance protection; he began his career at British and European and in 1981 moved to Swiss Re where he was initially Head of Underwriting and later became Head of UK Marketing. He left in 2001 to set up an independent consultancy, Le Beau Visage, which focuses on differentiation in the Protection sector. Since starting Le Beau Visage, Peter and Andy Couchman (Bank House Communications) have set up The Protection Review www.protectionreview.co.uk; he has set up a strategic discussion group called The-Net-Work www.the-net-work.org and in 2005 Peter and Clive Waller (CWC Research) have set up the Income Protection Task Force www.protectingmyincome.co.uk to promote a greater awareness of the value of the product. Peter is a non-executive director of Fineos, Red Arc, Health Claims Bureau and Exeter Family Friendly. In 2007 Cover magazine voted Peter the most influential person in the UK protection industry over the previous 10 years and in 2009 he was voted Health Insurance magazine’s Personality of the Year. Peter is a regular contributor to Health Insurance, Financial Adviser and Money Marketing. 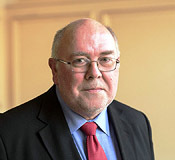 Peter was awarded the MBE for services to Insurance in June 2009. Frances has spent most of her career in Insurance. She had a long and varied career within the Life Division of Swiss re between 1984 and 1996 and helped Peter set up Le Beau Visage when it was formed in February 2001. Frances is responsible for all the administration of the business and, with many years' experience managing major conferences, is responsible for running The-Net-Work and The Protection Review Seminar and Launch Dinner.